However, I want to share just this bit more. I am constantly astonished by how much better my life is now than when I ate gluten. If you have been reading this site for awhile, you know this is true. In fact, you have been watching the story unfold  finding my health, writing here, getting an agent, meeting Danny, publishing a book, Lucy arriving in our lives, writing a cookbook, moving to our island home, going around the country talking with people about this cookbook. Add to this the fact that I don’t have to grade papers anymore? That alone would be enough, frankly, to make me say that living gluten-free is joy for me. But here’s the other part I love. Would I have ever made cannoli from scratch when I thought I could eat gluten? No way. I would have driven to a bakery and eaten the work of other people’s hands. That bakery cannoli? No way I would ever remember them as vividly as I will remember these gluten-free cannoli. I’ll never forget spending the afternoon with my dear friend Nina, who came over just to make cannnoli with me, Danny, and Lucy. None of us had cannoli tubes. None of the stores we looked in had cannoli tubes. So we winged it. Nina’s wonderful husband, Booth, fashioned some cannoli tubes out of old bicycle handles. The kitchen was a cluttered mess from all the baking we had been doing earlier in the day. Lu skipped her nap, so she was cranky and clingy, the opposite of her usual self. Danny heated up the oil, then he had to leave for work. The handlebars were too thick, so we switched to something smaller. That’s why you could have found me in our kitchen, wrapping gluten-free cannoli dough around a bright blue Sharpie (pen cap on, of course). Those were too thin. So, like Goldilocks (and the Buddha), we found the middle way: the handle of an offset spatula. In spite of the fact that the shells kept popping open in the hot oil, or being too small to fill with ricotta, we were laughing. No matter that Lu wanted to jump up and down on the conter and knock cannoli shells around, Nina and I kept going. We made fresh ricotta togehter, the first time for both of us, and were amazed at how easy it is. And the shells, even the broken ones, had the same cisp exterior and flaky soft interior of a real cannoli shell. Eureka. The next day, the lovely woman who runs Lu’s daycare – a former student of mine, who found out a year ago she should not be eating gluten and became pregnant after years of trying  read my update on Facebook. “I have cannoli tubes.” And so, we borrowed a bag of battered metal tubes to make this decadent treat again. This time, Danny and I did this together. The dough kept sticking to the tubes when we tried to slide it off before going into the oil, so we greased them down. With greasy fingers, and the kids of our friends bouncing on Lu’s bed, we plunked cannoli dough into the hot oil. Again, some of them opened, but we just dusted those with powdered sugar and gave them to our brunch guests. Our friend Alejandra, who grew up first in Argentina (in an Italian area) and then Philadelphia, and thus grew up eating a lot of cannoli, took a few bites of the cannoli shells, then said, “Oh my god, these are fantastic. I like how buttery they are, with a slight tang, from the buttermilk.” She took another bite. “These are better than regular cannoli,” she said. We made another batch of fresh ricotta (so easy! ), with Alejandra watching so she could do it at home. When it cooled, we stuffed the few shells that stayed together with fresh ricotta, cinnamon, and sugar. I took the photo you see on top, and then we ate. Wow. Heaven. You see, I like eating cannoli. (However, after this week, I don’t want anything sweet for a month. Ugh.) I made these so that we could make them again someday. But really, I made these because so many of you wrote that you remember making these with your grandmother, and you thought that sweet ritual of baking together was gone forever. Here they are. Make some cannoli. One thing I have learned through teaching myself how to convert gluten recipes to gluten-free recipes: choose a great recipe as your inspiration. I searched through hundreds of cannoli recipes online and many of them looked dubious to me. However, when I found this recipe from The Arthur Avenue cookbook, I had my base. The author of this recipe grew up in a bakery making cannoli, then became a baker himself. He wouldn’t lead us astray. Find the best source you can for a reliable recipe, then play. That’s what I do all day these days. I love it. Plus, in the end, you get cannoli. Preparing to make the cannoli. Have all the ingredients ready in a mise en place. Pour the 1 quart of safflower oil into a large Dutch oven. Set the Dutch oven over a burner on medium-high heat. You’re starting to heat it to 320°. Making the dough for the shells. In the bowl of a stand mixer, combine the flour, xanthan gum, guar gum, sugar, shortening, salt, and cinnamon. Run the mixer on low speed to combine the ingredients and aerate the flour. Pour in the rum, honey, and egg, then mix until they are combined. Here’s where you are going to need to use your own judgment  add the buttermilk 1 tablespoon at a time with the mixer running. You are looking for the dough to come together and wrap around the paddle of the mixer. So add 1 tablespoon at a time, let the mixer run, and watch. If the dough is still dry, add another tablespoon. Rolling the dough. Put half the ball of dough between 2 pieces of parchment paper on the counter. Roll out the dough as thin as you can, about 1/4 inch thick. Now, if you have a cannoli cutter, as the original recipe says to use, pull that out here. If not, we cut a big oval around the cannoli tubes. Put a cannoli tube in the center of that oval of dough, then flip the cannoli tube so the edges of the dough are hanging down. Brush egg wash in between the two flaps of dough, then press them together. Crimp and press until they are sealed. Repeat with the remaining cannoli tubes. Cooking the cannoli. When the oil has reached 320°, gently put the cannoli shells (still attached to the tubes) in the hot oil. (Keep the kids away and be extra-vigilant yourself when you are working with hot oil.) Try 3 at a time in the hot oil, cooking until they are golden brown, about 3 minutes each. 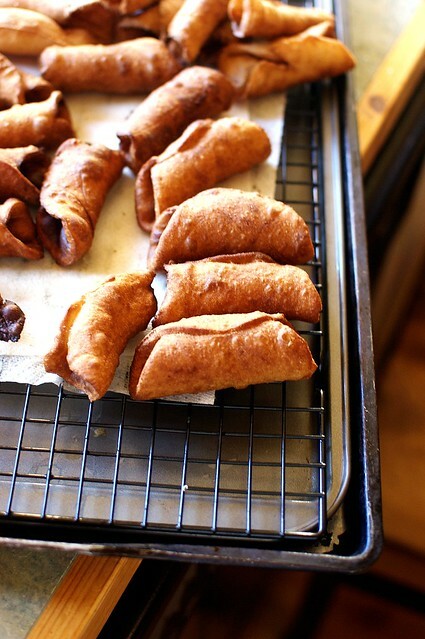 Put the cannoli shells on paper towels to drain, then cook the rest in the hot oil in batches until you are done. Turn off the burner and slide the Dutch oven to the back of the stove so no one gets hurt. Let the cannoli shells cool completely, then gently pull out the cannoli tubes. Combine the ricotta, sugar, cinnamon, and chocolate chips in a bowl. Fit a pastry bag with a large tip, then stuff the bag with the filling. Pipe the ricotta mixture into the cannoli. Sprinkle the cannoli with powdered sugar. I am so stoked! You are my fearless kitchen goddess… I will never forget standing in front of hot oil- something I've been afraid of, refusing to deep fry my whole life- and using that open metal spatula- the name evades me again… (bad holidaze brain) and frying cannoli shells with you in your kitchen, messes be damned. And Lucy calling me "Nia." Too cute she is. You know I'll be printing every bit of this post and it will get splattered with oil over and over again. Now I just need to buy a mixer. Do you think I could do this with my hand mixer or my Cuisinart? Love you dear Shauna. Happy Solstice! Bless you! I used to live around the corner from Ferrara Bakery in the East Village and I LOVED their cannoli. I can honestly say it's one of the few things I miss now after almost 4 years of living gluten free. I am so going to make these! Can you figure out how to make good gluten free asian dumplings? That's the other thing I miss and I can't get the wrapper right. It will be exciting to try this version, although I've found it quite easy to use my electric pizzelle iron to make my GF shells. I just use a nut based flour for my pizzels & roll them up as soon as they come out of the iron. (This also works as a waffle cone or bowl–yum. This version sounds fun though! I saw this and thought "wow – that's a big deal" GF cannoli! Bless you, sweet woman, bless you!! I'm so excited to try these!! Thank you for posting the recipe!! Merry Christmas!! Wow….ohhhh wow. These look friggin amazing! I'm with Erin…what about a really good gluten free dumpling dough for chinese??? I am still feeling somewhat challenged with cakes and cookies…they are coming..but slowly. Want to do dumplings filled with pork, chicken, and all the other yummy fixings? Shauna, you're a marvel! I am Italian – my grandmother was Sicilian. I was just going through my family's Italian cook book mourning the fact that I can't have cannoli. And then I popped on here to check today's post and here it is! I need to find cannoli tubes in Seattle or online though. I wonder if my nana would have liked the GF cannoli: She always complained that Seattle didn't have any "authentic" cannoli, as she was from the East Coast. I'm going to give your recipe a try. Thanks again and Happy New Year! I grew up having real Boston-North End cannoli on Christmas Eve with my grandparents. I haven't tasted one in 7 years! Thank you for your hard work! Can't wait to try these!! Yumm! I love the story — bike handles, sharpie … Thanks for the laugh and pictures in my head. Sounds so much fun! Oh Wow! I've wanted to try cannoli for so long but didn't know where to start to adapt the recipe. It's so awesome that you put in so much work to figure these things out and share them with us. I'm forever grateful. You've made my transition into gluten free something I'm enjoying instead of dreading. Thank you! very cool! my friend and i converted her great-grandmother's cannoli recipe to a GF one a few years ago. she was so happy to get her cannoli back! Oh I love cannoli! I'm not much of a dessert girl but I love biscuits and I love cream – perfection! I'll try these and if I succeed they'll make a lovely gift for my gluten free girlfriend when I pop my head in to her place on Christmas morning! Your blog is an inspiration! If ever there were a time for me to celebrate the miracle of Christmas, it is today… as I read this post… and sing the praises not ONLY of a treat that I used to thoroughly enjoy at Mike's Pastries in the North End of Boston BUT because the only conversion that I have to make is the flour from grams to cups. Hallalujah Glory Hallelujah. Merry Christmas Shauna, Chef and Lu… you have made MY holiday merry and bright. I'm always amazed at your conversions of traditional foods into gluten-free wonders, but this one has my mind spinning! I've only had cannoli twice since learning of my gluten intolerance, both times at an Italian restaurant with an extensive gf menu (DaLuciano's outside of Chicago). If gf cannoli is on the menu for dessert, there's no other choice for me. Now they can be mine any time! Thank you. Merry Christmas, Shauna. Ahh!!! I love you!!! 🙂 YUM YUM YUM! and if anyone doesn't mind not having a real cannoli….our bakery in Little Italy sells "Chips & Dip" Just a tub of cannoli cream (filling) and broken pieces of the shells for dipping. You could easily do this and not have to have sharpies, bike handles or cannoli tubes. 🙂 Can't wait to make some!!! 🙂 mmmm….. I love you so much right now. That is all. You are just so amazing Shauna! You're truly an inspiration to me. I recently found your blog and love it! I currently do not eat gluten-free, but have been wondering about it for awhile. I plan to go back and read all of your past blog entries and see what you have to say about it. Those cannoli look amazing! I have never eaten them, and my mouth is watering from the picture and your amazingly descriptive story. Thank you! If I could just figure out a way to make this & eat it while still staying dairy free! Is there any option for me? You can also use Marsala wine as a buttermilk substitute in the cannoli shell dough. Oh My…I am sure this dessert will occupy my dreams for the next week or so. However, I need to make some adjustments. I am allergic to cane sugar and eggs (currently experimenting my tolerance to duck-eggs, but I prefer to keep things egg-free). I’m thinking Egg Replacer for the dough, and for the egg wash, I typically use non-virgin olive oil with water. For those who have tried this recipe, what do you think of Xilitol or Stevia? Stevia is a sweet/bitter flavor that adds depth to a fluffy/airy dessert. Xilitol all sweet/light, perfect for something like this, but I wonder if it would be too much (maybe if it was an egg-free canolli, I would prefer xilitol) Suggestions? Please e-mail me if you have any thoughts. Has anyone tried making the shells the night before an event? Wondering if they would stand up or get soggy. Shauna, this looks great – thanks! I am planning to make this tomorrow, Dec 23, for our Christmas Eve party. I was planning to make the shells tomorrow and make the filling and fill them on the actual eve. Any one have experience with whether the shells hold up for a day at least? Those look scrumptious! Oh my! These look AMAZING and I’m dying to try making them! Looking to go more gluten-free….since I am lactose intolerant I am realizing that staying away from gluten as much as I can is a good thing. It’s almost more fun to “allergize” recipes in my mind! One question… xanthan gum scares me. I don’t understand what it is or how it’s used in recipes. Could you shed light? I am gluten free and vegan. Would these recipes work without eggs, I would be using an egg replacer. And why are so many gluten free baking recipes necessary with the gums? I am new to gluten free and baking is all still a mystery to me. I was wondering if these could be baked. Not big on frying things.